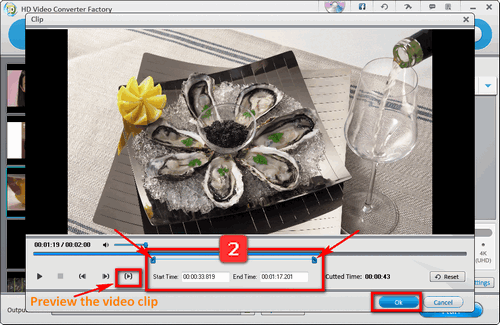 The most powerful and handy MKV video cutter for Windows users. If you have so many MKV files that are large in size and you want to cut off the extra part and maintain the high original quality, you need to use the MKV splitter to help you. This review will introduce you three free MKV cutters and the specific cutting steps are also demonstrated for you. Read and find the needed tool to help you split MKV files. For those who have lots of many MKV videos you shot or MKV movies you downloaded and find they are large in size which occupied so much device room. And you want to cut them to the smaller ones yet are wondering which is the best MKV file splitter that can cut MKV files without losing quality. The answer is here as this review will demonstrate you three kinds of MKV video editors that can help you cut or split the large MKV files effortlessly. WonderFox Free HD Video Converter Factory can serve as a perfect MKV editor that can cut the MKV files at one go. With this tool, you can split the MKV videos with or without re-encoding at will. And it won’t sacrifice the video quality since it can even edit 4K videos handily. Besides, it’s fast and free. Moreover, there’s no file size limit and watermark on the final output videos. WonderFox Free HD Video Converter Factory can serve as an excellent MKV editor that can cut the MKV videos with simple steps. After continuous technical updates, the current Free HD Video Converter Factory can cut MKV video with three times the acceleration. And there’s no file size limit and it renders you a friendly interface, you can find the needed function at a glance. Let’s just have a check now. Launch this tool, and here you add your MKV videos in batches. Also, you can import MP4, AVI, MOV, and other videos for cutting. You may like: Trim MP4, AVI Splitter, VOB Cutter. Click the scissors-like icon to move up to the MKV video editing window. Here you can cut MKV by dragging the slider on the timeline. Or for accurate video cutting, you can specify the exact start time and end time. Besides, you can preview the section to see if it is the expect video clip. Once this is done, hit “OK” to save the video. For you who do not want change the original video format, you can set MKV as the output format under the Video tab. If you want to convert the cut MKV videos, choose the desired output format or device. For instance, you can convert MKV to MP4, AVI, TV, iPad, etc. Hit the Run button to cut MKV files at the sharp speed. Pros and cons: It’s free and easy-to-handle for all levels. There’s no file size limit and you can even cut 4K, 8K MKV videos via this tool without deteriorating the video quality. Besides, you can batch add the MKV files for cutting. Yet this tool has the English version only and it is exclusive to Windows computers. Certainly, there are many professional video editors in the market and you have heard many of them, such as Openshot, VSDC, etc. Here I will set an example of how to split MKV files via VSDC Free Video Editor. Step 1: Install this MKV video splitter from the official site: [http://www.videosoftdev.com/free-video-editor]. Step 2: Launch it and click the “Import content” icon on the main interface to import one MKV video. Step 3: It will pop up a window to set the project information like project title, resolution, frame rate, etc. After done, this MKV file will be added to the timeline automatically. Step 4: On the timeline, choose the area you want to cut by moving the blue rectangles. Step 5: Now hit the “Cut out fragment” button on the Tools section of the Editor tab. The chosen section will be removed from the video immediately. Step 6: Don’t forget to export the project. Pros and cons: Besides video editing, VSDC can also add audio to video, capture videos, burn DVDs. Yet it has a complicated operating interface and new users need time to familiarize yourself with this program. And for more video editing functions, you need to purchase the costly pro version. Sometimes, users are failed to play VPROJ file created by VSDC and want to convert VPROJ file to MP4 or other formats. A versatile program that can be a great video editor, converter and downloader. Namely, you can take it to crop, merge, rotate MKV videos and more. Also, it supports you to convert MKV to other formats and vice versa. Besides, it is capable of downloading 720P/1080P/2K/4K/8K MKV videos or movies at a lightning-fast speed. Step 1: Visit the official site of clipchamp video editor: [https://clipchamp.com/en/video-editor]. Step 2: You have to register an account first and after you log in, you can create a new project. Follow the instruction to enter the project title and upload an MKV video for cutting. Step 3: Drag the MKV file to the timeline. Step 4: Moving the white vertical bar to choose the unwanted sections and then click the scissors icon in the white bubble at the top of the bar to cut off the clips. Step 5: After done, export the video to your local disk. Here the server will export the video in 480P, while the 720P/1080P resolution is on the way. Remember, you can only cut 5 videos per month via clipchamp.com with a free account. Pro and cons: Online MKV cutters are convenient and you do not need to install any programs on your computer, yet they have a strict requirement on the network connection. And usually, most of the online video cutters set restrictions on the file size and they will cost you much time since you need to upload the videos to the server for cutting as well as download the final video to local disk. Anyway, the mentioned three ways can all help you cut MKV files and you can choose the needed tool and corresponding method to deal with how to split MKV files at one go. And if you need an easy-to-handle MKV splitter, you can try WonderFox Free HD Video Converter Factory and download it here to start the MKV cutting process.